Barn Owls – one pair currently nesting. Little Owls are regularly seen especially at dusk. Kestrels have successfully bred for the last three years in the specially designed Kestrel Box. You can see this year's chicks in the photo on this page; they've been ringed so that anyone who finds them will know where they were born. 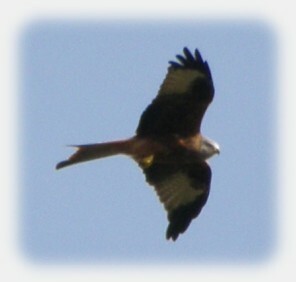 Red Kites are very regular visitors and can often be seen diving down to collect food that has been placed for them in the field. They are very daring birds and have been seen to swoop on the wolves' food and steal it if the opportunity presents itself. As many as twelve have been seen at one time. Buzzards – We had one pair breed last year and are hopeful that they will return this year. Grass Snakes are seen in the warmer weather in the fields surrounding the enclosures. Hares are regular visitors and are often seen in the fields surrounding the Trust. 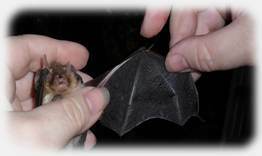 A survey in November 2011 found bats are living at the Trust, with a brown long-eared bat found to be using one of our bat boxes. A copy of the report from the Berkshire and South Buckinghamshire Bat Group can be found here. Badgers – we have a very active sett within the site, which is monitored by four CCTV cameras. In previous they have had a litter of cubs but so far this year we have seen two adults on camera snuffling about in the woodland but no cubs. Deer are regular visitors to the woodland and Muntjac, Fallow and Roe deer are often seen when out walking the wolves! There is an abundance of other small birds regularly seen on the site such as Green Woodpeckers, Greater Spotted Woodpeckers and the usual garden birds such as Robins etc. We provide nest boxes for these birds and they are used each year. Many bats are seen at dusk. In 2008 we made a small pond in the field nearest to the wolves enclosure. This has attracted heron, a pair of nesting ducks as well as much pond life. Many tracks of animals are seen in the edges of the pond as they drink there. There is an established butterfly garden with plants that attract butterflies as well as several buddlias and nettles which all help the population and which results in many species being seen at the Trust in the summer months. A small stream, the Bourne, runs at the bottom of the field near the pond which enables the wolves to have a good paddle and drink in. The Bourne goes into the Pang river and then at Pangbourne it joins the Thames. Herons are sometimes seen down at the stream, as well as deer. In 2010 we planted a wildlife meadow in the area near the stream and are now reaping the rewards of cowslips and many other wild flowers. March 2011 saw the planting of 1100 native English trees by volunteers, including hornbeam, oak, ash, holly and maple. The wood covers two hectares and has four trails leading to a central glade. It's hoped that in years to come the wood will benefit the wildlife on site and also provide an additional pleasant area for the wolves to walk in and enjoy.